(CNN) - They're a half dozen of the biggest names in the Republican Party, hailing from different wings of the GOP. And they're all teaming up next month to help the Republican National Committee raise money. New Jersey Gov. 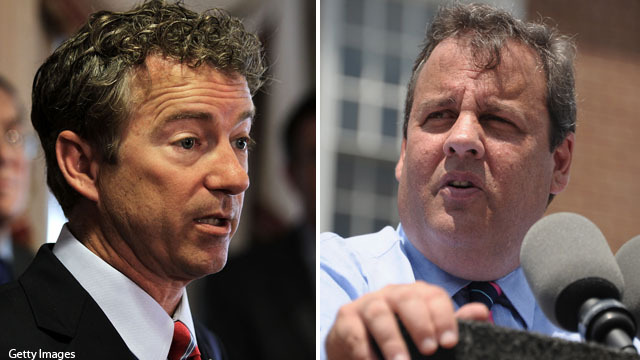 Chris Christie, Senators Marco Rubio of Florida and Rand Paul of Kentucky and Wisconsin Gov. Scott Walker are all co-headlining a fundraiser being hosted by RNC Chairman Reince Priebus and New York Jets owner Woody Johnson (a major Republican donor), a source with knowledge of the September 23 event in New York City confirmed to CNN. Rep. Paul Ryan of Wisconsin, the 2012 GOP vice presidential nominee, and Michigan Gov. Rick Snyder, are listed as "special guests" at the gathering. Other than Snyder, all of the men are considered possible contenders for the 2016 Republican presidential nomination. Politico was first to report on the fundraiser. I'm actually surprised that Gov. Christie was invited. But, then again this is the RNC and not CPAC. PREDICTION: That blond woman with the long hair and face will say the following, "If we don't get Chris Christie to run, then Rand Paul will be our party's nominee and we will lose." "People pulled together in the face of the tragedy of 9/11 and Bush enjoyed an 80%+ approval rating afterwards, for no discernible reason other than America pulled together." Indeed we did, Sniffit. I realized three days into the Obama Administration that the GOP was never going to pull together with Obama no matter what he did, why he did, or when he did. American media was the most critical I have ever heard in all my years of political interest. Yes. The media. Clutching their GOPerville talking points to their cold brazen hearts as if it were the holy writ, nary a true thought in their collective minds. This is why I am here five years later. Just to let them know, it didn't work.